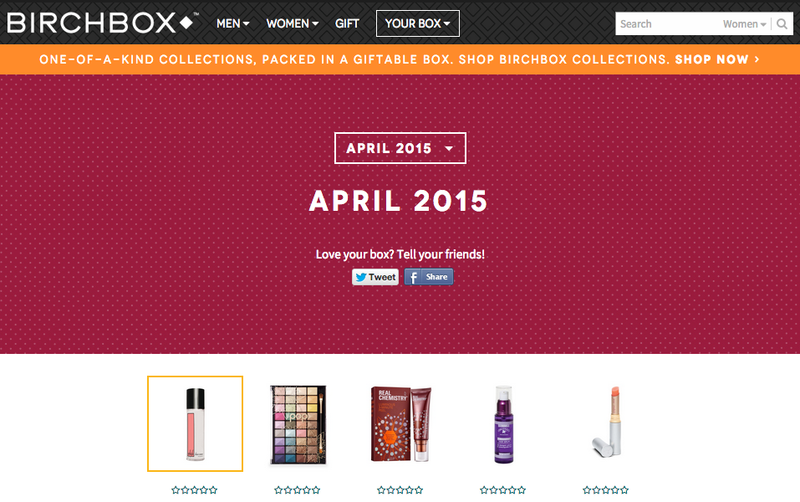 Birchbox: How to Peek at Your Box Early! In case you didn’t know, Birchbox is a $10/month subscription service for at least five sample (sometimes full-sized!) beauty products. If you are interested in subscribing, feel free to use my referral link. I came across this trick on Reddit a while ago to view your samples before you can officially see them on the 10th of each month! For the past couple of months, I have used this trick to look at my samples since I like to know right away. I just viewed my box, so I figured I would share this trick! Now before you get too excited, note that this link may not work for you. Also, this may not always be accurate. The actual box you receive could be different, so the samples you see through this trick may not actually be what you actually receive. This preview may change as well. For example, while using this trick during an earlier month, this preview listed 7 samples! When I looked again later, it changed to the normal 5. In the future, just update the year and month at the end of the URL! I don’t particularly care for the shaving cream and eyeshadow palette, but I may try them out. The peel could be interesting. I have been getting lots of hair products, so I’ll add this serum to the pile. The lip and cheek stain looked interesting, so I hope it will be a good color for me! I’m sorry it doesn’t work for you 😦 but I saw new Canadian Birchbox subscribers will receive beautyblenders! I’m still hoping for a day I will receive one! What an awesome tip! Thanks for sharing! Thank-you for sharing about the Birch Box. I love beauty products and make-up!!!! Was thinking about trying birchbox. Thanks for the tips! I love this blog! Have you got any tips on how to become more popular? Ooh, what a great tip! I don’t have a subscription but that’s super nice to know what you’ll get beforehand! I so wish they would make this available in Canada. I love surprises but I love knowing too. Yes, all of Canadian subscribers received a beauty blender but I traded mine. I do have a brush from Luxe Box or Loose Button that I find I use more than my blender. It’s pretty cool but had a real strong chemical smell. Thanks for the tip. The items on my third box were not appearing. I tried your tip, and it worked. I am so going to use this! Thanks for sharing the find! Thanks for following my blog and introducing me to yours.